An Inside Sales Representative works within the sales department and typically are involved in bringing sales to the company by making cold calls to clients. The job roles and responsibilities that are carried out by these professionals to enhance sales revenue of the firm include – working with customers, identifying the needs, creating solutions, ensuring smooth sales transactions, closing deals, sourcing new opportunities, routing the customers to right executive, maintaining and expanding customer database for the allotted territory and performing successful online product demos. 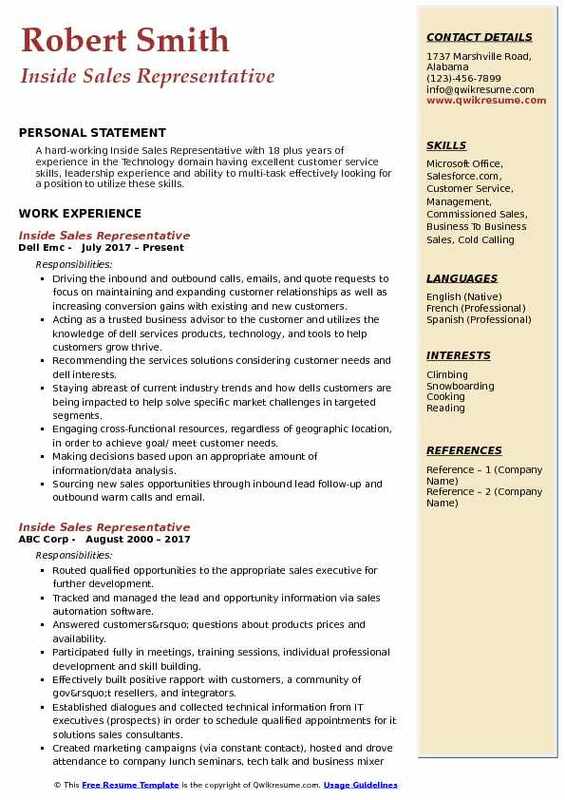 The minimum requirements that decide the success of an Inside Sales Representative include – inside sales expertise, a track record of crossing sales target, telephone etiquette, proficiency in web presentation tools, experience working in relevant software like Salesforce.com or CRM, strong listening and communication skills. 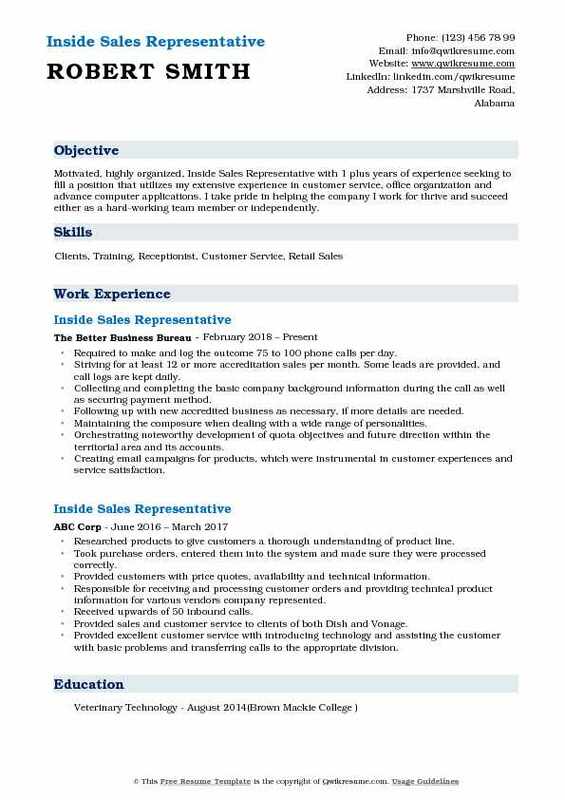 Most of the candidates applying for this employment mention in the Inside Sales Representative Resume a degree in the field of marketing or sales. Summary : Inside Sales Representative III with 18 plus years of experience is looking to become a part of an organization that is positioned in the market competitively and innovatively and have an open opportunity for a sales professional with a diverse sales background who can train and develop its sales force to grow its business and footprint in a given marketplace. 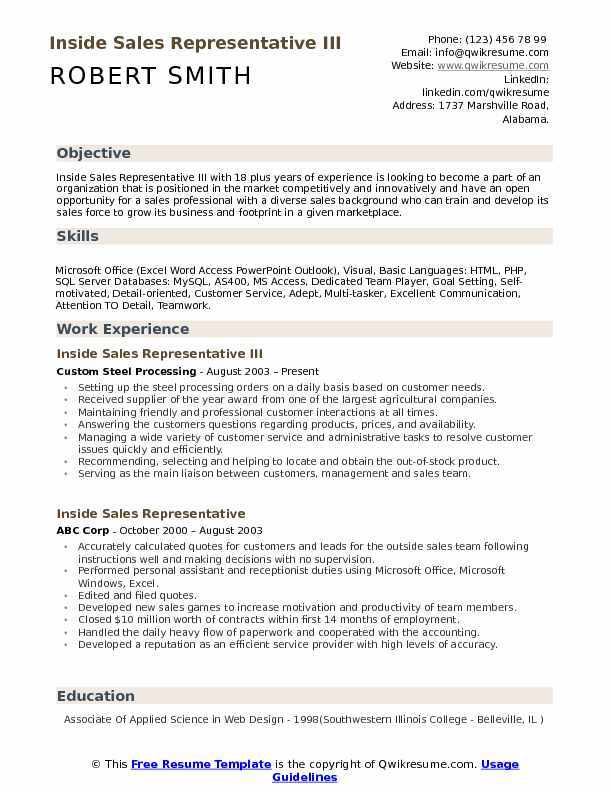 Skills : Microsoft Office (Excel Word Access PowerPoint Outlook), Visual, Basic Languages: HTML, PHP, SQL Server Databases: MySQL, AS400, MS Access, Dedicated Team Player, Goal Setting, Self-motivated, Detail-oriented, Customer Service, Adept, Multi-tasker, Excellent Communication, Attention TO Detail, Teamwork. Setting up the steel processing orders on a daily basis based on customer needs. Received supplier of the year award from one of the largest agricultural companies. Maintaining friendly and professional customer interactions at all times. Answering the customers' questions regarding products, prices, and availability. Recommending, selecting and helping to locate and obtain the out-of-stock product. Serving as the main liaison between customers, management and sales team. Investigating and resolving the customer inquiries and complaints in a timely and empathetic manner. 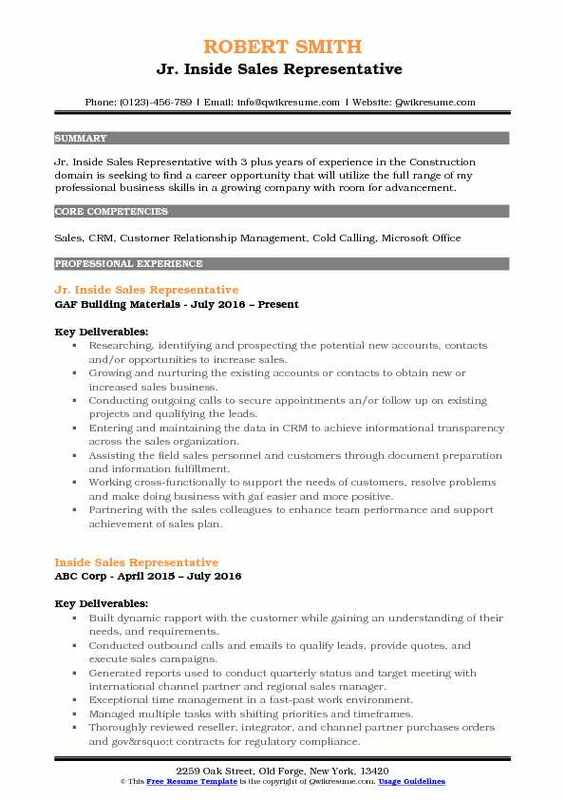 Summary : Inside Sales Representative with 19 plus years of experience with skills in fostering customer relations, developing and achieving daily sales goals, and effective in providing a high-octane, energetic and motivated sales team. Responsible for sales, inventory, purchasing, shipping, and technical information. Sales orders are to be looked over and turned into operations manager on a daily basis. Inventory must be watched constantly and purchase order are to be submitted to various vendors as quickly as possible to keep up with demand. Managed 80% of a $40 million business case consisting of $2.3 million in sales monthly. Answered customer inquiries and questions regarding product and service offerings. Responsible for entire sales cycle via phone including sales presentation, overcoming objections, processing credit applications, processing payments and scheduling. Consistently meet and exceed sales goals to become top sales person in my office. Summary : Inside Sales Representative IV with 21 plus years of experience is seeking to pursue a career in which my assets, extensive knowledge and efforts can contribute to the success of the company and my professional development. 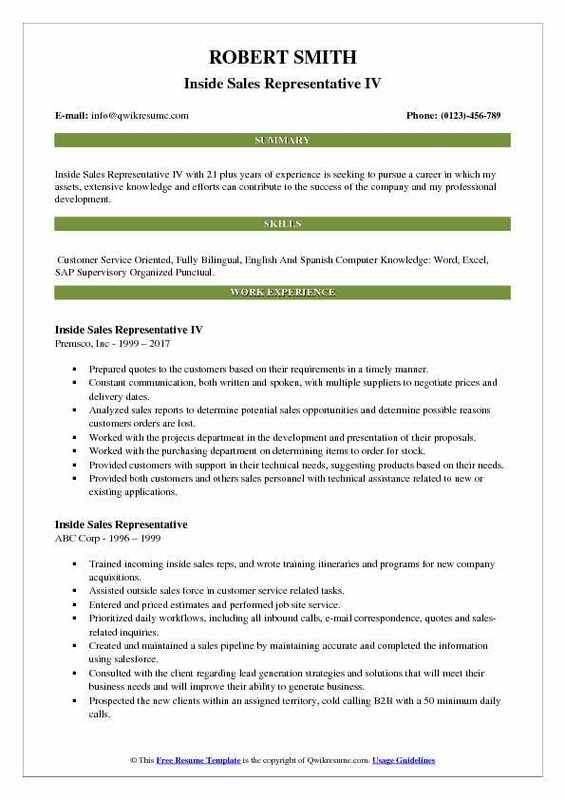 Skills : Customer Service Oriented, Fully Bilingual, English And Spanish Computer Knowledge: Word, Excel, SAP Supervisory Organized Punctual. Prepared quotes to the customers based on their requirements in a timely manner. Constant communication, both written and spoken, with multiple suppliers to negotiate prices and delivery dates. Analyzed sales reports to determine potential sales opportunities and determine possible reasons customers orders are lost. Worked with the projects department in the development and presentation of their proposals. Worked with the purchasing department on determining items to order for stock. Provided customers with support in their technical needs, suggesting products based on their needs. Provided both customers and others sales personnel with technical assistance related to new or existing applications. Answered customers questions regarding products, prices, and availability. Followed up with existing accounts and generating new business opportunities. 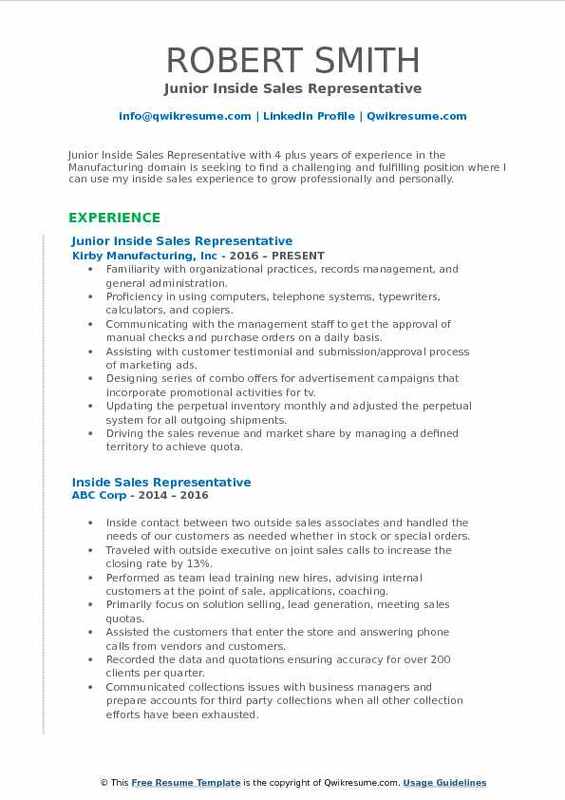 Objective : Junior Inside Sales Representative with 4 plus years of experience in the Manufacturing domain is seeking to find a challenging and fulfilling position where I can use my inside sales experience to grow professionally and personally. Familiarity with organizational practices, records management, and general administration. Proficiency in using computers, telephone systems, typewriters, calculators, and copiers. Communicating with the management staff to get the approval of manual checks and purchase orders on a daily basis. Assisting with customer testimonial and submission/approval process of marketing ads. Designing series of combo offers for advertisement campaigns that incorporate promotional activities for tv. Updating the perpetual inventory monthly and adjusted the perpetual system for all outgoing shipments. Driving the sales revenue and market share by managing a defined territory to achieve quota. Working to make sure all orders were taken care of and delivered in a timely manner. Providing an input on stock items and provided takeoffs and quotes in a timely manner. 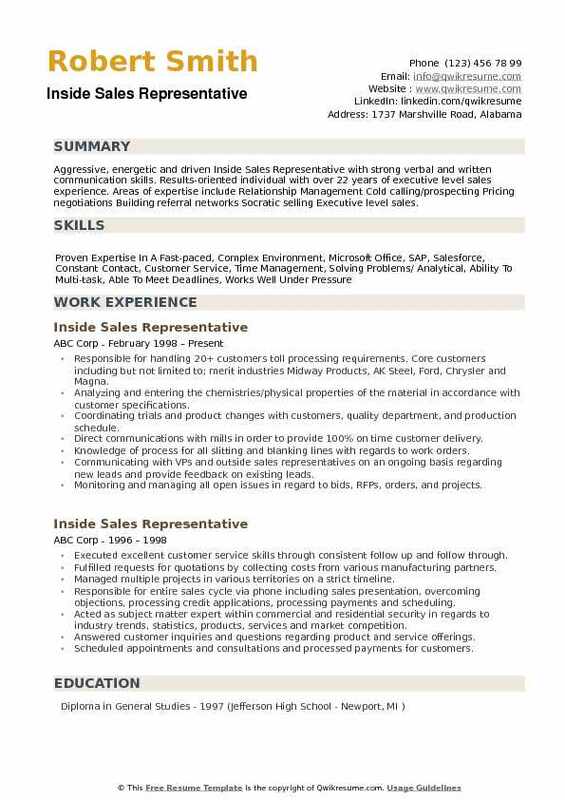 Summary : Senior Inside Sales Representative with 7 years of experience in the Manufacturing domain is seeking to secure a challenging career opportunity utilizing my previous experience while providing professional enrichment to both my future employer and myself. Supported the customer accounts as assigned to include order processing, quotes, and customer communication. Monitored SAP and looked for product trends. Made recommendations to support customer base accordingly. Maintained the price list for both sales purchasing within the SAP system. Provided the formal quotations as needed and offer customers alternate products as directed. Strengthened relationships with identified customers through increased communications. Generated the weekly, monthly, quarterly, or yearly reports as requested. Included but not limited to on-time delivery (OTD) and late order reports. Distributed the correspondence to appropriate sales representative relating to their territory. Assisted with the trade show coordination and attended exhibitions when necessary. Managed customer account resolution while maintaining customer relations to secure optimal sales and minimize bad debt exposure. 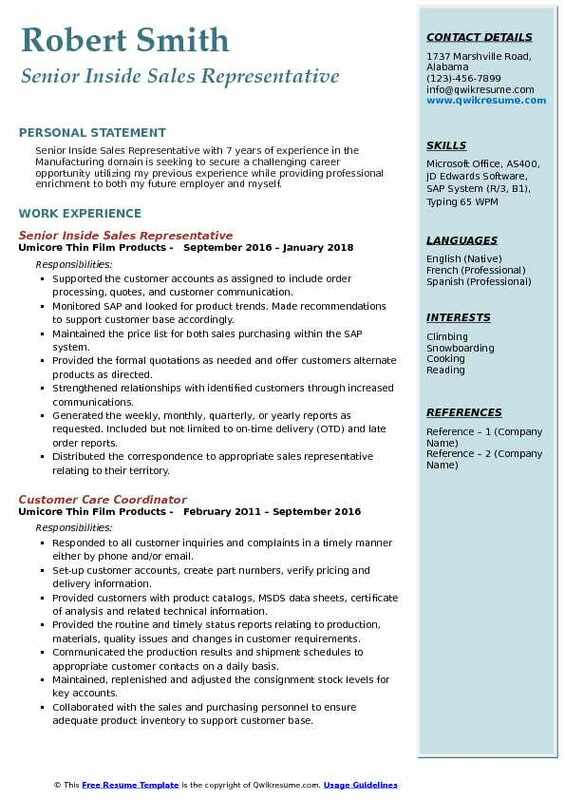 Objective : Motivated, highly organized, Inside Sales Representative with 1 plus years of experience seeking to fill a position that utilizes my extensive experience in customer service, office organization and advance computer applications. I take pride in helping the company I work for thrive and succeed either as a hard-working team member or independently. Required to make and log the outcome 75 to 100 phone calls per day. Striving for at least 12 or more accreditation sales per month. Some leads are provided, and call logs are kept daily. Collecting and completing the basic company background information during the call as well as securing payment method. Following up with new accredited business as necessary, if more details are needed. Maintaining the composure when dealing with a wide range of personalities. Orchestrating noteworthy development of quota objectives and future direction within the territorial area and its accounts. Creating email campaigns for products, which were instrumental in customer experiences and service satisfaction. Cultivating leads in security systems and automation through conversation via phone, email and sms lead to a signed agreement with the company. Summary : Skilled Inside Sales Representative with 13 years of experience who is highly-motivated, sales-oriented, eager to obtain a management or sales position in a strong and growing company with the opportunity for advancement. Closed 34 new clients worth over $10 million of new business revenue within the first 14 months. Global account manager for both OfficeMax and office depot platform customers. I maintained over 110$ imu as well as over 100% sales year after year. Ability to create relationships over the phone which leads to increased sales. I also showed the ability to handle multiple large revenue clients and solve their issues with shipping, pricing and customer service issues. Working with existing clients to provide product knowledge and new promotions. Calling on warm and cold leads to add the new business for the company. Demonstrated breadth and depth of knowledge to position and map hp capabilities that effectively aligned to client business objectives and initiatives. Consulted with small and medium businesses to design hardware and software solutions to suit their technology needs. Interfaced with a highly diverse set of functions and buyers at all levels within the customer organization. Identified emerging market trends and opportunities. Conducted multi-product services, complex sales, and integrated solutions. Objective : Jr. 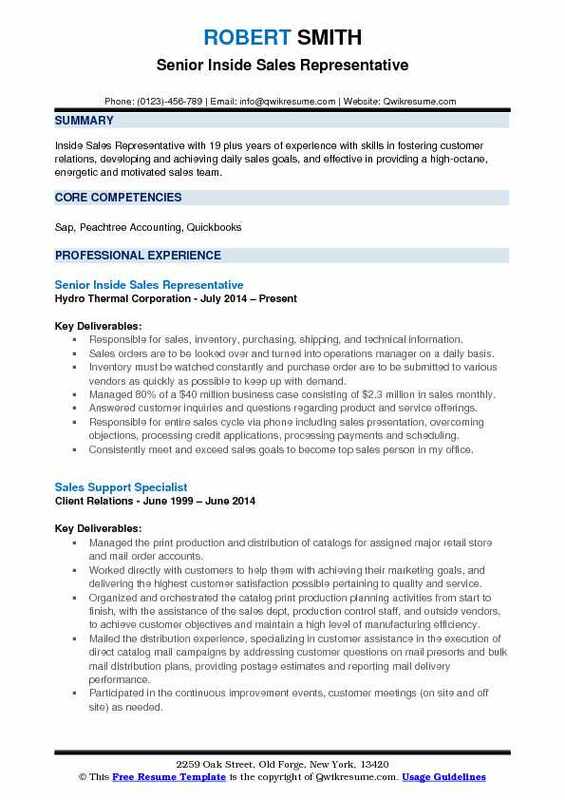 Inside Sales Representative with 3 plus years of experience in the Construction domain is seeking to find a career opportunity that will utilize the full range of my professional business skills in a growing company with room for advancement. Researching, identifying and prospecting the potential new accounts, contacts and/or opportunities to increase sales. Growing and nurturing the existing accounts or contacts to obtain new or increased sales business. Conducting outgoing calls to secure appointments an/or follow up on existing projects and qualifying the leads. Entering and maintaining the data in CRM to achieve informational transparency across the sales organization. Assisting the field sales personnel and customers through document preparation and information fulfillment. Working cross-functionally to support the needs of customers, resolve problems and make doing business with gaf easier and more positive. Partnering with the sales colleagues to enhance team performance and support achievement of sales plan. Fielded inbound sales call ensuring the customers’ inquiries were answered in a timely manner. Summary : A hard-working Inside Sales Representative with 18 plus years of experience in the Technology domain having excellent customer service skills, leadership experience and ability to multi-task effectively looking for a position to utilize these skills. Driving the inbound and outbound calls, emails, and quote requests to focus on maintaining and expanding customer relationships as well as increasing conversion gains with existing and new customers. Acting as a trusted business advisor to the customer and utilizes the knowledge of dell services products, technology, and tools to help customers grow thrive. Recommending the services solutions considering customer needs and dell interests. Staying abreast of current industry trends and how dells customers are being impacted to help solve specific market challenges in targeted segments. Engaging cross-functional resources, regardless of geographic location, in order to achieve goal/ meet customer needs. Making decisions based upon an appropriate amount of information/data analysis. Sourcing new sales opportunities through inbound lead follow-up and outbound warm calls and email. Summary : Aggressive, energetic and driven Inside Sales Representative with strong verbal and written communication skills. 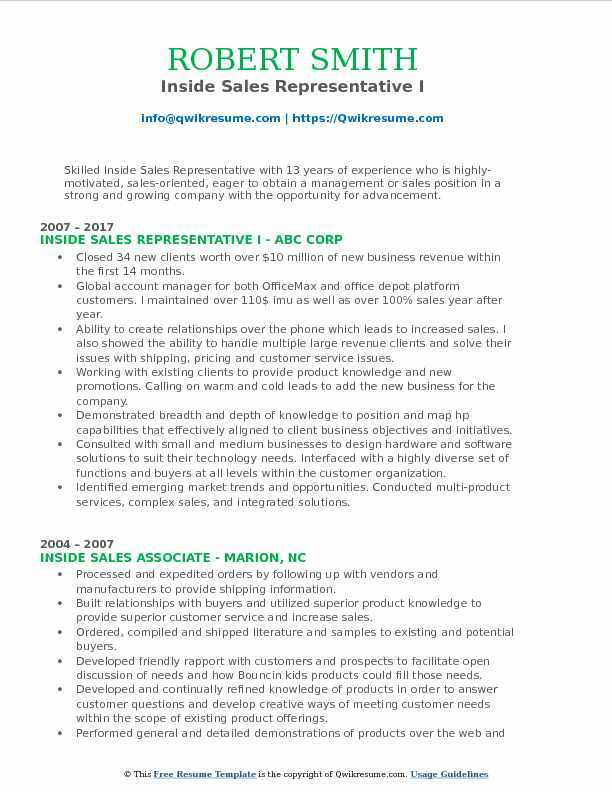 Results-oriented individual with over 22 years of executive level sales experience. Areas of expertise include Relationship Management Cold calling/prospecting Pricing negotiations Building referral networks Socratic selling Executive level sales. Responsible for handling 20+ customers toll processing requirements. Core customers including but not limited to; merit industries Midway Products, AK Steel, Ford, Chrysler and Magna. Analyzing and entering the chemistries/physical properties of the material in accordance with customer specifications. Coordinating trials and product changes with customers, quality department, and production schedule. Direct communications with mills in order to provide 100% on time customer delivery. Knowledge of process for all slitting and blanking lines with regards to work orders. Communicating with VPs and outside sales representatives on an ongoing basis regarding new leads and provide feedback on existing leads. Monitoring and managing all open issues in regard to bids, RFPs, orders, and projects. Conducting webinars regarding search engine optimization to educate potential clients.